Kei seems such a warm lady. The kind of person you want as a friend. Kei deserves worship for being such good fun. ^ I agree. She always sticks up for everyone when they are being picked on by others (like taka-san) but the rest of momusu relentlessly picks on her.. why?? ^MM just went along with some of the jokes and fun about Kei-chan, so it was no doubt in a good natured way. Kei-chan was definitely loved while she was in MM, and is still loved, rightfully so. Makoto said that when she first joined Morning Musume that Kei used to go to singing lessons with and hold her hand because Makoto kept crying during the lessons. I thought that was really sweet and kind of Kei giving Makoto moral support. Aww! I never knew that!!! I think Kemeko made an extra effort to help the newer girls because when she first joined, they weren't as welcomed, but yeah~ Kemeko is AWESOME! 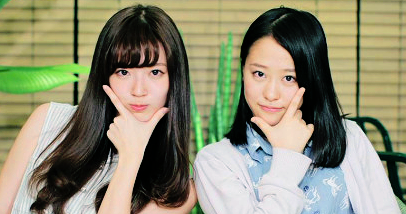 I think when Kei graduated from Morning Musume.They lost something very important to the way the group was run. Kei seemed like a kind big sister to all of the younger members. Someone told me a story about Kei.That some tv comic was playing a prank on some members and annoying them with a camera.Anyway this comic had been annoying Risa and made her cry.Kei came out of nowhere and grabbed the camera off of him and threw it at him breaking the camera.She then went a comforted Risa. Seems she was always the one to lookout for the younger ones. I wish we saw more of Kei in Hello Morning because she has such enthusiasm for everything that happens there. Kemeko seemed always underappreciated. But always great for Utaban! I agree with you on this, TD. Kei-chan is also very underrated, and with her awesome voice she shouldn't be, but that's how it seems to go in the world of H!P. Well she went into acting and does that now. I Wish i could of seen her in a midsummer nights dream. Thats probably my fav play anyway and she would of been as awesome bonus. I wonder if any of those plays Kei-chan is in will ever be on DVD? That'll be something real good to see. I agree. I liked Kei-chan, she's funny and she'll play along. I kinda feel bad for her when she's on Utaban. ^When you think about it, if Taka-san and Nakai-kun don't pick on someone, it might they don't like them, maybe. So, they're constant picking on Kei-chan no doubt meant they liked her, and Kei-chan was always a good sport about it. I would love to see it on DVD. Don't we though? Same with Atsuko, so seeing that dinner show thing would be pretty awesome. Maybe, since we're getting all sorts of crazy things like a new Melon single and a Mai PB... we'll get something cool from Kei. That would really make my H!P year. Check out Ayaka's Surprise English Lesson when Ayaka intentionally clicks off the phone as Kei is talking to her mom. Ayaka: "Do you have any cheaper ones?" Kei: "Do you have a cheaper man?" I would like to see more of Atsuko too. Getting something with Kei in it would be great.I have always wondered why Kei 's never had a solo single release as Kei has such a lovely voice.